We have a pretty solid house. It’s not going to fall down anytime soon (God willing). But the wind at 3 a.m. in the morning shook us at our very foundation. It didn’t last long, this wicked wind that came from nowhere, but the windows were rattling and the walls were moaning. Eyes closed as I kept sleep close enough to fall back into, I could envision the world outside as the fury increased, the landscape rushing by on the gusts of the changing weather front. 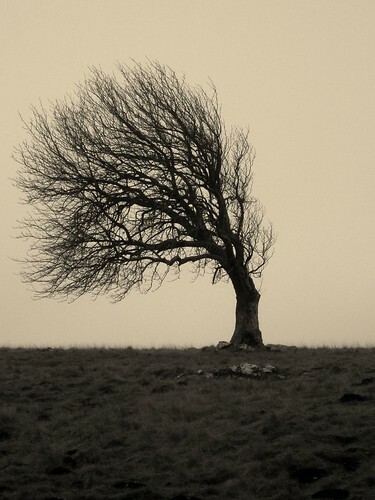 No doubt, it is winds like that which inspire writers to create strange winds of change in stories. I am reminded of Something Wicked This Way Comes for some reason. I don’t want to be. It was that kind of wind. Not a kind breeze. But a gust that could move you into something strange and unknown. I huddled closer to the blanket. The dog got up from one of the kids’ rooms, clicking his paws on the hardwood floor in the hallway. No doubt, he was wondering: what the heck was that? And then he disappeared again, finding comfort downstairs in his crate. He knows a thing or two. So does the wind. I wonder, though, where that wicked wind went when it left us at 3 a.m. in the morning? Did it find you? Did it leave you with a story, too? The wind was like that yesterday in our neck of the woods. My boys didn’t want to play outside for very long because they were freaked out by how gusty it was. We are surrounded by trees, and there were too many that seemed to be reaching for them. I was curious of my older son’s reaction: He asked me again and again WHY is it so windy? He wanted an explanation, while the younger just wanted assurance that the trees would not fall. Two different reactions to the same thing! The wind is an unknown entity – coming unexpectedly at times, and with great power — so although a discussion about air pressure might scientifically help your one son understand the nature of wind, the real mystery is what your younger son worried about: what will happen now that the wind is here? It’s bad enough in the daylight to experience a wicked wind, but in the dark of the early morning hours it becomes a whole different being. Glad you didn’t discover any damage when daylight emerged. I often see trees like the one in the photo, when we drive across the country and it hurts to see that this plant has been whipped by the wind so long and often that the shape is altered.